The ultimate rein for creating that perfect "feel"! Finally, innovation meets function! 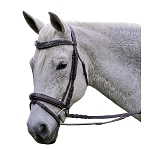 ThinLine has improved upon the rubber reins! From your first ride through the next several years, these reins will consistently feel the same. No breaking in time... the rein molds in your hand. No rubber breakdown after just a few months of riding like traditional rubber reins. 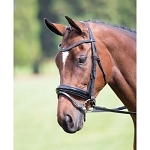 A new favorite among top dressage and jumping riders! ThinLine reins have a nylon core for strength yet flexibility, then topped with ThinLine wrapped around for grip and consistency. 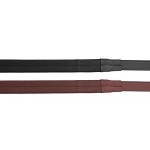 The ends are made of 5/8" English leather with a choice of buckle or stud hook closure. Rein thickness is 3/4", yet suitable for those with small hands or arthritis. Size 54" rein is considered standard size while 60” is for larger Warmblood breeds. 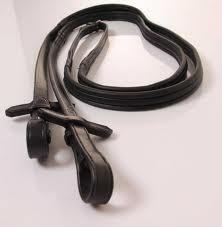 Available in solid black, or the new solid brown colored reins!